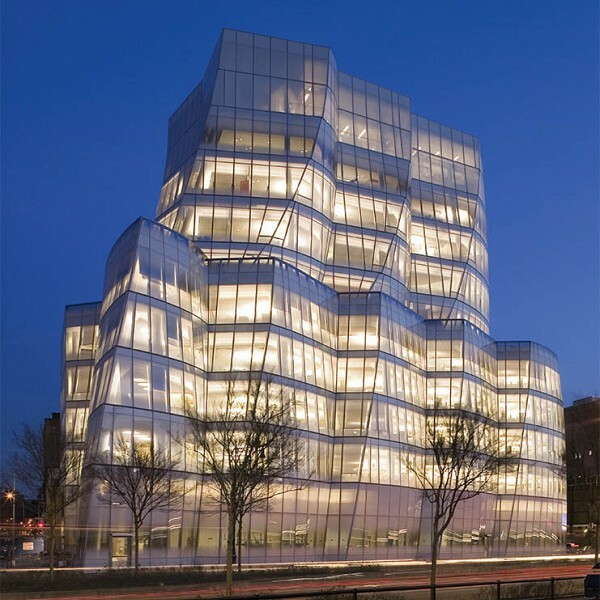 Description: The new world headquarters of InterActive Corp. is an iconic building in Manhattan’s Chelsea neighborhood, and the first commercial office building in New York City designed by renowned architect Frank Gehry. The 10-story building is home to 400 IAC employees and encompasses over 175,000 sf. Designed to express IAC’s innovative, forward-thinking culture, the building features a uniquely shaped façade constructed of cold-warped glass panels specialty treated to enhance environmental efficiency and reduce glare. The project’s interiors promote employee interaction and workplace flexibility. Wi-Fi throughout the entire building encourages employee collaboration. All employee work spaces are exposed to natural light. Cosentini's engineering design included state-of-the-art mechanical systems that maximize occupant comfort and energy efficiency.